Map of Island Heights in Ocean County. Inset: Location of Ocean County highlighted in the State of New Jersey. Island Heights is a borough in Ocean County, New Jersey, United States. As of the 2010 United States Census, the borough's population was 1,673, reflecting a decline of 78 (-4.5%) from the 1,751 counted in the 2000 Census, which had in turn increased by 281 (+19.1%) from the 1,470 counted in the 1990 Census. The borough is a dry town where alcohol cannot be sold. Island Heights was incorporated as a borough by an act of the New Jersey Legislature on May 6, 1887, from portions of Dover Township (now Toms River Township), based on the results of a referendum held on November 18, 1886. Island Heights takes its name from two sources: it originally was an island. It is situated by a steep bluff rising 60 feet (18 m) above the Toms River. It was originally known as Doctor Johnson's island, being included in the patent granted to him in 1680. In the century before the American Revolutionary War, it was known as Dillon's Island, probably for James Dillon, a prominent man in Toms River. The land was purchased by John Imlay of Allentown, who sold it in 1794 to Issac Gulick. In 1797, Gulick and his wife Abagail sold it to Abraham and George Parker. In 1799, the Parker brothers sold it to Abel Middleton of Upper Freehold Township. According to the United States Census Bureau, the borough had a total area of 0.907 square miles (2.350 km2), including 0.611 square miles (1.582 km2) of land and 0.296 square miles (0.767 km2) of water (32.65%). Unincorporated communities, localities and place names located partially or completely within the borough include Long Point. The borough borders the Ocean County municipalities of Berkeley Township and Toms River Township. As of the 2010 United States Census, there were 1,673 people, 683 households, and 486.979 families residing in the borough. The population density was 2,738.3 per square mile (1,057.3/km2). There were 831 housing units at an average density of 1,360.2 per square mile (525.2/km2). The racial makeup of the borough was 95.82% (1,603) White, 0.24% (4) Black or African American, 0.12% (2) Native American, 1.37% (23) Asian, 0.00% (0) Pacific Islander, 0.36% (6) from other races, and 2.09% (35) from two or more races. Hispanic or Latino of any race were 2.39% (40) of the population. There were 683 households out of which 25.0% had children under the age of 18 living with them, 57.0% were married couples living together, 10.0% had a female householder with no husband present, and 28.7% were non-families. 22.0% of all households were made up of individuals, and 9.2% had someone living alone who was 65 years of age or older. The average household size was 2.45 and the average family size was 2.88. In the borough, the population was spread out with 18.5% under the age of 18, 7.0% from 18 to 24, 21.0% from 25 to 44, 35.9% from 45 to 64, and 17.6% who were 65 years of age or older. The median age was 47.0 years. For every 100 females there were 91.4 males. For every 100 females ages 18 and older there were 90.2 males. The Census Bureau's 2006-2010 American Community Survey showed that (in 2010 inflation-adjusted dollars) median household income was $77,269 (with a margin of error of +/- $5,616) and the median family income was $96,458 (+/- $21,090). Males had a median income of $75,234 (+/- $7,830) versus $47,045 (+/- $11,606) for females. The per capita income for the borough was $39,493 (+/- $4,086). About 5.6% of families and 5.7% of the population were below the poverty line, including 7.8% of those under age 18 and 1.2% of those age 65 or over. As of the 2000 United States Census there were 1,751 people, 705 households, and 497 families residing in the borough. The population density was 2,909.2 people per square mile (1,126.8/km2). There were 807 housing units at an average density of 1,340.8 per square mile (519.3/km2). The racial makeup of the borough was 97.77% White, 0.11% African American, 0.46% Native American, 0.63% Asian, 0.06% from other races, and 0.97% from two or more races. Hispanic or Latino of any race were 1.37% of the population. There were 705 households out of which 28.8% had children under the age of 18 living with them, 57.0% were married couples living together, 10.5% had a female householder with no husband present, and 29.4% were non-families. 24.3% of all households were made up of individuals and 9.8% had someone living alone who was 65 years of age or older. The average household size was 2.48 and the average family size was 2.97. In the borough the population was spread out with 22.4% under the age of 18, 6.6% from 18 to 24, 24.5% from 25 to 44, 29.2% from 45 to 64, and 17.3% who were 65 years of age or older. The median age was 43 years. For every 100 females, there were 92.8 males. For every 100 females age 18 and over, there were 87.4 males. The median income for a household in the borough was $61,125, and the median income for a family was $72,596. Males had a median income of $47,500 versus $38,375 for females. The per capita income for the borough was $26,975. About 2.6% of families and 4.1% of the population were below the poverty line, including 3.5% of those under age 18 and 9.1% of those age 65 or over. Island Heights is governed under the Faulkner Act form of municipal government, formally known as the Optional Municipal Charter Law, within the Small Municipality (Plan A), enacted by direct petition as of July 1, 1974. The government consists of a mayor and a six-member council, elected in non-partisan elections held as part of the November general election. The mayor is directly elected to a four-year term of office. Councilmembers serve three-year terms of office on a staggered basis, with two seats coming up for election each year in a three-year cycle. As the result of an ordinance passed unanimously by the borough council in July 2011, the borough shifted its nonpartisan elections from May to November. As of 2016[update], the Mayor of Island Heights Borough is Jeffrey B. Silver, whose term of office ends on December 31, 2018. Borough Council members are Council President Sean Asay (2017), John Bendel (2017), Steve Berglund (2018), Kieran E. Pillion Jr. (2016), Sandra Blain Snow (2016) and Susan Thompson (2018). Brian Taboada, who had been serving a term ending in 2014, announced at an August 2013 council meeting that he would be stepping down from office to focus on school obligations. The borough is protected by the Island Heights Volunteer Fire Company, which was established in 1895. 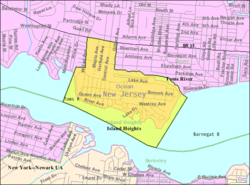 Island Heights is located in the 3rd Congressional District and is part of New Jersey's 10th state legislative district. As of March 23, 2011, there were a total of 1,329 registered voters in Island Heights, of which 285 (21.4%) were registered as Democrats, 415 (31.2%) were registered as Republicans and 629 (47.3%) were registered as Unaffiliated. There were no voters registered to other parties. Among the borough's 2010 Census population, 79.4% (vs. 63.2% in Ocean County) were registered to vote, including 97.4% of those ages 18 and over (vs. 82.6% countywide). In the 2012 presidential election, Republican Mitt Romney received 52.2% of the vote (508 cast), ahead of Democrat Barack Obama with 46.7% (454 votes), and other candidates with 1.1% (11 votes), among the 978 ballots cast by the borough's 1,333 registered voters (5 ballots were spoiled), for a turnout of 73.4%. In the 2008 presidential election, Republican John McCain received 52.9% of the vote (558 cast), ahead of Democrat Barack Obama with 44.5% (469 votes) and other candidates with 2.1% (22 votes), among the 1,054 ballots cast by the borough's 1,371 registered voters, for a turnout of 76.9%. In the 2004 presidential election, Republican George W. Bush received 53.9% of the vote (568 ballots cast), outpolling Democrat John Kerry with 44.5% (469 votes) and other candidates with 1.0% (14 votes), among the 1,054 ballots cast by the borough's 1,380 registered voters, for a turnout percentage of 76.4. In the 2013 gubernatorial election, Republican Chris Christie received 67.5% of the vote (459 cast), ahead of Democrat Barbara Buono with 30.1% (205 votes), and other candidates with 2.4% (16 votes), among the 703 ballots cast by the borough's 1,303 registered voters (23 ballots were spoiled), for a turnout of 54.0%. In the 2009 gubernatorial election, Republican Chris Christie received 59.8% of the vote (453 ballots cast), ahead of Democrat Jon Corzine with 32.6% (247 votes), Independent Chris Daggett with 6.5% (49 votes) and other candidates with 0.9% (7 votes), among the 757 ballots cast by the borough's 1,346 registered voters, yielding a 56.2% turnout. The Island Heights School District serves public school students in kindergarten through sixth grade at Island Heights Elementary School. As of the 2014-15 school year, the district and its one school had an enrollment of 163 students and 13.8 classroom teachers (on an FTE basis), for a student–teacher ratio of 11.8:1. Public school students in seventh through twelfth grades attend the schools of the Central Regional School District, which also serves students from the municipalities of Berkeley Township, Ocean Gate, Seaside Heights and Seaside Park. Schools in the district (with 2014-15 enrollment data from the National Center for Education Statistics) are Central Regional Middle School for grades 7 and 8 (669 students) and Central Regional High School for grades 9 - 12 (1,333 students). As of May 2010[update], the borough had a total of 12.18 miles (19.60 km) of roadways, of which 9.28 miles (14.93 km) were maintained by the municipality, 2.73 miles (4.39 km) by Ocean County and 0.17 miles (0.27 km) by the New Jersey Department of Transportation. New Jersey Route 37 is the main highway serving Island Heights. Route 37 brushes the north edge of the borough, heading east towards Seaside Heights and west towards Lakehurst. Route 37 also provides access to New Jersey Route 35, U.S. Route 9 and the Garden State Parkway, among other major highways. NJ Transit offers seasonal bus service between the borough and the Port Authority Bus Terminal in Midtown Manhattan on the 137 route and to Newark on the 67 route. Ocean Ride local service is provided on the OC10 Toms River Connection route. See also: Category:People from Ocean County, New Jersey. John F. Peto (1854–1907), painter. Gia Maione Prima (1941–2013), singer and widow of Louis Prima. ^ a b Mayor and Council, Borough of Island Heights. Accessed July 26, 2016. ^ Borough Hall, Borough of Island Heights. Accessed July 27, 2016. ^ a b 2012 New Jersey Legislative District Data Book, Rutgers University Edward J. Bloustein School of Planning and Public Policy. p. 53. ^ U.S. Geological Survey Geographic Names Information System: Borough of Island Heights, Geographic Names Information System. Accessed March 6, 2013. ^ a b c d e f DP-1 - Profile of General Population and Housing Characteristics: 2010 for Island Heights borough, Ocean County, New Jersey, United States Census Bureau. Accessed June 9, 2012. ^ a b c Table DP-1. Profile of General Demographic Characteristics: 2010 for Island Heights borough, New Jersey Department of Labor and Workforce Development. Accessed June 9, 2012. ^ a b c 2010 Census Populations: Ocean County, Asbury Park Press. Accessed July 18, 2011. ^ a b GCT-PH1 Population, Housing Units, Area, and Density: 2010 - State -- County Subdivision from the 2010 Census Summary File 1 for New Jersey, United States Census Bureau. Accessed December 25, 2012. ^ Look Up a ZIP Code for Island Heights, NJ, United States Postal Service. Accessed June 9, 2012. ^ Zip Codes, State of New Jersey. Accessed October 16, 2013. ^ Area Code Lookup - NPA NXX for Island Heights, NJ, Area-Codes.com. Accessed October 16, 2013. ^ A Cure for the Common Codes: New Jersey, Missouri Census Data Center. Accessed June 9, 2012. ^ Table 7. Population for the Counties and Municipalities in New Jersey: 1990, 2000 and 2010, New Jersey Department of Labor and Workforce Development, February 2011. Accessed December 25, 2012. ^ Snyder, John P. The Story of New Jersey's Civil Boundaries: 1606-1968, Bureau of Geology and Topography; Trenton, New Jersey; 1969. p. 203. Accessed June 9, 2012. ^ Island Heights Borough, Ocean County Historical Society. Accessed August 3, 2006. ^ Areas touching Island Heights, MapIt. Accessed August 10, 2015. ^ Fifteenth Census of the United States : 1930 - Population Volume I, United States Census Bureau, p. 714. Accessed December 25, 2012. ^ a b c d e Census 2000 Profiles of Demographic / Social / Economic / Housing Characteristics for Island Heights borough, New Jersey, United States Census Bureau. Accessed December 25, 2012. ^ a b c d e DP-1: Profile of General Demographic Characteristics: 2000 - Census 2000 Summary File 1 (SF 1) 100-Percent Data for Island Heights borough, Ocean County, New Jersey, United States Census Bureau. Accessed December 25, 2012. ^ DP03: Selected Economic Characteristics from the 2006-2010 American Community Survey 5-Year Estimates for Island Heights borough, Ocean County, New Jersey, United States Census Bureau. Accessed June 9, 2012. ^ "The Faulkner Act: New Jersey's Optional Municipal Charter Law" Archived 2013-10-12 at the Wayback Machine, New Jersey State League of Municipalities, July 2007. Accessed October 16, 2013. ^ Mayor and Council Newsletter, Borough of Island Heights, July 19, 2011. Accessed January 23, 2015. "After first reading and introduction of Ordinance 2011 – 09, the Mayor and Council Members unanimously approved an ordinance to change the regular municipal elections currently held in May to the general election date in November." ^ 2016 Municipal Data Sheet, Borough of Island Heights. Accessed July 26, 2016. ^ Borough of Island Heights, Ocean County, New Jersey. Accessed July 26, 2016. ^ Mayor and Council Newsletter - Council Meeting, Borough of Island Heights, August 20, 2013. Accessed October 16, 2013. "Council Member Brian Taboada stated it is with great regrets that he informs the borough of his resignation from the Island Heights borough council." ^ History, Island Heights Volunteer Fire Company Station 53. Accessed July 26, 2016. "The Island Heights Volunteer Fire Company No. 1 was organized on February 14th, 1895 by a group of residents who realized the need for fire protection in the community." ^ District information for Island Heights Board Of Education, National Center for Education Statistics. Accessed December 7, 2016. ^ Ocean County Bus / Rail Connections, NJ Transit, backed up by the Internet Archive as of July 26, 2010. Accessed December 25, 2012. ^ Barron, James. "RESTORING AMERICA'S PAST: BED AND BREAKFAST INNS", The New York Times, May 14, 1987. Accessed June 9, 2012. "Joy Peto Smiley operates the Studio of John F. Peto, a B & B in the house in Island Heights, N.J., where her grandfather painted portraits and landscapes." ^ Sapia, Joseph. "Louis Prima's widow seeks royalties ISLAND HEIGHTS WOMAN WED BANDLEADER IN '63 Louis Prima's wife files suit over royalties", Asbury Park Press, December 24, 2002. Accessed July 18, 2011. "AN Island Heights woman - the last of musician Louis Prima's five wives - is suing a California recording company, seeking royalties for the showman's work." Wikimedia Commons has media related to Island Heights, New Jersey.